When Surya the sun god got married his wife could not bear the heat of his rays and ran away. Surya was heartbroken and the world plunged into darkness. A dwarf asked a king for some land, which he measured with three footsteps, and ended up claiming the earth and the sky. Sage Daksha got his daughters married to the moon, but later, in a fit of rage, cursed the moon with consumption, making it wax and wane. These are some of the fifty myths from India recounted in this fabulously produced book. From wise sages to demonic asuras, beautiful river deities to arrogant kings, wayward gods to brave princes, this collection showcases the most enchanting and magical stories from Indian mythology. With over 100 stunning full-colour illustrations, this book will not only bring alive a fantastic world of gods and demons, it will also be a loved and treasured possession to be enjoyed for many years. Coming after the rollicking Living Next Door to Alise about a boy Siddharth and a baby elephant, Magical Indian Myths is pure magic. Children apart, you too could up your mythology quotient. Nair has written another book on a similar subject: The Puffin Book of World Myths and Legends. Nair spins her tales with finesse, telling the reader how the sun became less fierce, how Bali lost his kingdom, why Ganga came to earth. Nair had recounted each story with such finesse that the characters seem to come alive. 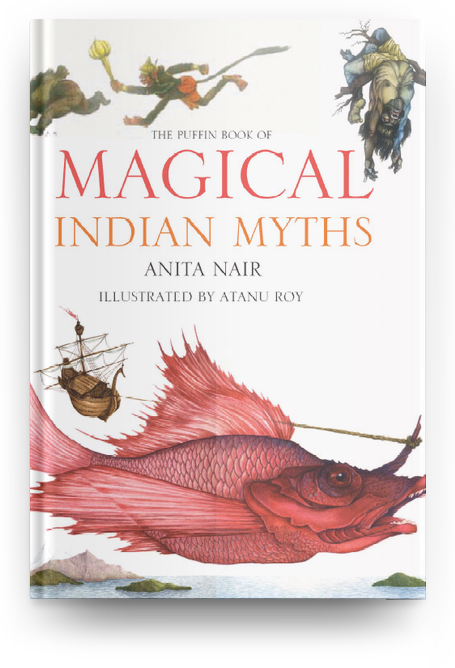 Magical Indian Myths, a collection of 50 myths belonging to Indian culture, knows exactly how to tell a myth, making it an exceptionally successful book in its genre and ‘a must have book’ for your child’s collection. It possesses all the qualities that make myth telling fascinating. Firstly, the 50 myths in the collection are very well selected. Secondly, the narration is simply fabulous. The stories are well told. They are short, crisp and clear and do not weave confusing yarns as mythological literature can at times do. Fortunate is the child who receives this beautiful book…. The stories are simply told, though never patronizing in tone, and are short enough to be read at one go by the young reader, or to be read aloud to children without taxing the patience of the adult reader or the attention span of the little listener. Charmingly written…the content of this book is consistently absorbing and provides mythological answers to questions that fascinate children. Apart from the efforts of Anant Pai, there hasn’t been much quality literature on Indian myths, written from a child’s viewpoint. Nair has finally filled this lacuna. Her stories are short, and dealt with as simply as possible to present complicated mythological tales. She passes no value judgment, yet, shows that even the gods are not always fair, while even the demons are sometimes higher in virtue. The best thing about this book is that the myths she recounts are relatively fresh, and therefore not done to death already. She treads a fine line. The language is simple enough for a six or seven-year old to grasp, and yet, not childish. Her descriptions are rich, vivid and action-packed. Unlike other mythical tellings, she doesn’t digress to explore issues of higher consequence. Whether it is the Dasavatara or Vishvamitra’s rise to brahmarishi status or the moon’s waxing and waning, none of the 50 tales in this book is new. But the slightly irreverent tone and language gives it a new feel. Fortunate is the child who receives this beautiful book as a new year present. The stories are simply told, though never patronising in tone, and are short enough to be read at one go by the young reader, or to be read about to children without taxing the patience of the adult reader or the attention span of the little listener. The book contains 50 tales from Indian myths, and at under Rs 10 a myth, is very good going indeed.